Background. Sound propagation in the ocean can be strongly modulated by oceanographic processes. The Southern East China Sea is a place where a variety of processes with different spatial and temporal scales occur. These processes include: Kuroshio intrusions over the continental slope and shelf, intrusion of subsurface water via submarine canyons onto the continental shelf (Cold Dome), internal tides and internal waves. Historic drifter observations suggest that Kuroshio intrusions may depend upon the magnitude of the 100 day period Kuroshio transport variation, while internal tides and internal waves will have shorter periods. To sample the Kuroshio intrusion, a 500 day long period of surface drifter releases from south-eastern Taiwan has been implemented. 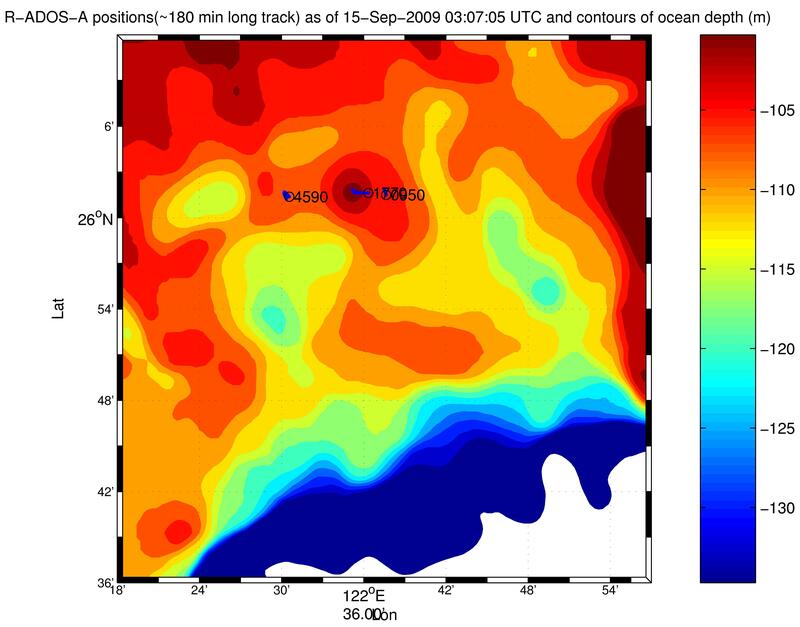 The combination of these observations with satellite remote sensed and other in-situ data will allow us to test the hypothesis of the intrusion dependence upon Kuroshio transport. Internal tides, internal waves, Cold Dome occurrence and mesoscale circulation will be investigated during a one month intense observations period (IOP) with surface drifters fitted with GPS receivers and with restrained thermistor chains equipped with thermistors and vertically profiling acoustic current meters (Restrained ADOS A), as well as water sampling and CTD casts performed Taiwanese Oceanographers. IOP observations from Restrained ADOS A instruments and surface drifters are available in real-time to all QPE participants on this website. Research Support. Funding for QPE has been provided by the Office of Naval Research (ONR). The principal investigators are Dr. Luca R. Centurioni and Dr. Pearn P. Niiler, both of the Scripps Institution of Oceanography. Engineering and/or programming support has been provided by: Dr. Dong-Kyu Lee; Christopher Martin, J.D. ; Christopher McCall; Phil Moses; and by Clearwater Instrumentation, Inc. of Watertown, MA.